A hiatal hernia occurs when a part of the stomach enters the chest cavity through a hole in the diaphragm. In this disease, the patient gets reflux of stomach acids into the esophagus which gives a burning sensation in the chest and throat. The exact cause of this problem is not known but, the disease is very common and affects almost 60% of people by the age of 60. If you are not suffering from unusually severe and problematic hiatal hernia, the best way to reduce symptoms is to make dietary and lifestyle changes. 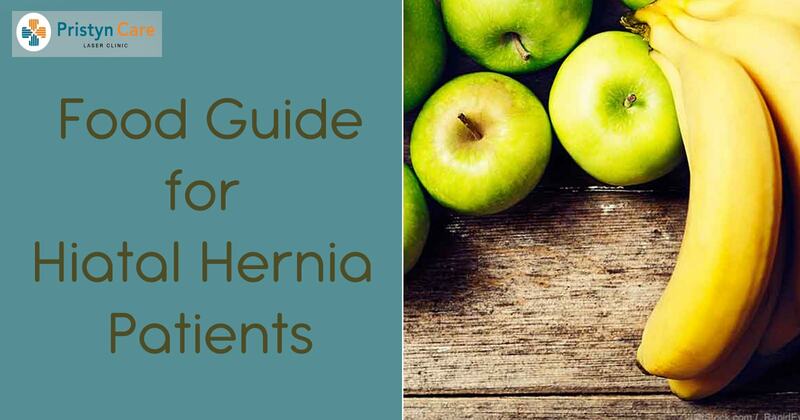 The best food options for people with hiatal hernia are non-acidic, minimally processed, and rich in dietary fiber. Here are some suggestions about foods to reduce the symptoms of hiatal hernia. Leafy greens, whole grains, beans and peas, lean proteins, tofu, fish, nuts and seeds, non citrus fruits and juices, ginger ,low-fat and non-sweetened dairy products, cardamom ,coriander ,apple cider vinegar, non caffeinated teas like green teas, probiotic foods without sugar as sugar supports the growth of stomach microbes. Fried or oily foods, fatty foods, red meat, caffeine, alcohol, cocoa and chocolate, tomatoes and tomato sauces, carbonated drinks, most types of mint, sweetened juices or teas, garlic, onions, spring onions, cucumbers, high-fat dairy products, salty foods, and junk foods. Some lifestyle adjustments are needed to help manage their hiatal hernia symptoms. Use high pillow while sleeping as it makes harder for stomach acid to travel up the esophagus. Eat whole foods instead of processed or refined foods. Exercise moderately for at least 20 minutes daily.